A new chapter begins today! Check out the new wallpapers and avatars in the DLC section, and be on the lookout for new random avatars in the comments! mmmm. Siphon brewed coffee, yum! That’s nothing compared to Heterodyne Spark Roast coffee! Damn you! No explanation about Bandit? Surely you didn’t think such a juicy development would be answered right away. Really, all we can hope for is that the chapter doesn’t start with something from Dedalus’s world. -earth shattering rumble- You fool! You’ve doomed us all! And it least it’s not raining. Don’t worry. This plan is foolproof. I thought that only worked on actors. I think the Unspoken Plan Guarantee usually overrides saying it’s foolproof. No plan will ever be foolproof because fools are so ingenious. But the thing is, I was just thinking about Dedalus. We’ve seen him fail to remove The Five, but I’ve always assumed he has other powers over them and the world. Can he revive NPCs? And so on. I did think that, and don’t call me Shirley. Yeah, how dare that trivia merit a new chapter! As a teacher, I can say that most of the time, we’re just happy you learned SOMETHING. Sometimes we’ll play to the audience to make it happen. We learned, that water is liquid and distilled water doesn’t carry electricity… It was a poor school… One time my physics teacher got upset and dropped her keys. She said: and that’s all about gravity to learn. Seems to be some sort of mystical…mystics room of inventions! You can’t get ye flask. There’s no liquid in ye jar. The [Dragon] is enraged by the sudden chill and crushes you with a blow from its tail. >Fight dragon with holy sword. You swing and land a mighty blow. The [Dragon] rears back and breathes fire, burning you to a crisp. The [Dragon] catches your scent. The [Dragon] rears back and breathes fire, burning you to a crisp. What, with your bare hands? Congratulations! You’ve just killed a mighty [Dragon] with your bare hands! Pretty neat, huh? A new chapter cover after a dramatic reveal. I anticipate some…volatile reactions, but only from those listening to their baser instincts. I’ll flask ya not the leave the door ajar for puns. Eye think we octopus these puns under a microscope – we need tube beaker-ful with them. pickled eyeballs, snakes, centipedes, scorpion? Indeed. The scorpion in particular sounds delicious, especially if fried. So Syr’nj’s mead was poisoned. As this page indicates, she’s gone to heaven. Which menas that the lack of intriguing reflections can only be deliberately done to infuriate. Drat. New chapter but no title ? Why ? Umm, because none of the other chapter cover pages had a title on them? Its title is the scrollover text. Title usually shows up at the end of the intro to the chapter. All this does is make me worry what happens when it gets printed without the ability to mouse over for text.
. . . Good question. I’ll have to make snarky, pun-laden comments to myself. It just won’t be the same. Dr. McNinja prints them on the bottom of the page in the border area. It works quite well. Hm. We know the core party do not realise they are in a game, and they are not ‘waking up’. I suspect the guy in charge is trying to get them out of there, and one way to do that is to send in another PC to break their fourth wall. Bandit, although killed, was not resurrected by Gravedust. Perhaps she respawned, as a MMORPG character should, and has been waiting for the others to do the same thing (she does not seem overly surprised to see them alive, after all, which she should be if she isn’t metagaming). In a past comic she also said she had a 9 in lockpicking (out of 10), which struck me as a very D&D stat-thing to say, even if it was covered by Thieves Guild comments afterwards. The ‘real world comes to call’ may be an allusion to our heroes encountering those who know they are players in a game. Y’ever think that the creator’s real plan was to put the people in the game, and revive them with their CHARACTER’S personalities instead of their original ones? So instead of being their normal selves, you’d have people with the personalities of Frigg, Byron, Syr’nj, Gravedust, and Bandit. And they’d get into shenanigans in the real world. Wow, that would be a lawsuit waiting to happen. You’d imagine that their families would be quite upset at their loved ones being overwritten by an alternate persona. Well yeah, but hey – villains don’t care for the law much, do they? He could be a villain. Simple, YET SO COMPLEX. The one where Syr’nj makes some serious mead. Too bad Tombdirt isn’t The Meadium, we might see him open up a bit. Well that’s just because of his mead-ger finances. Are you suggesting he could be a small Meadium at large? and Frigg starts a fight just for the ale of it. Looks like someone’s about to do something vial. Our heroes need to ‘scope out this alleged Bandit with care, beakers otherweyes they may fall into the trap of an ev-alchemy-leon. I don’t have Gold Star powers, but please accept this Bronze one. Technically, we should be awarding pyrite stars. Are you a general? Because the Bronze Star is, as they say on the internet, Kind of a Big Deal. I’d call a paragraph full of puns the complete opposite of “acts of merit.” I totally approve Thor’s recommended pyrite stars. Im more interesting in that red haired armored guy at the table, what is his schtick? Hitting things and being dour. Make room please, i think he and Frigg will be wanting to use the floor. World coming to a call smells like a raid to me. I love drawn glass objects. They’re always so beautiful, and it seems amazing to me to be able to capture the shape and line and translucence. …and then, when you notice that those glass objects aren’t refracting at all, the illusion is broken. And to be even fairer, I should point out that the specular highlights are very nice indeed. this makes me wonder.. how many chapters are planned? are we nearing the end? should i cry lots? I’m glad he’s got other projects, because I like his writing and I’m ready for Fans! and Penny and Aggie to be over. Ooh, beakers, and bottles and eyes, oh my! I can so do Science to that! Well, I guess the eyes have it. . . 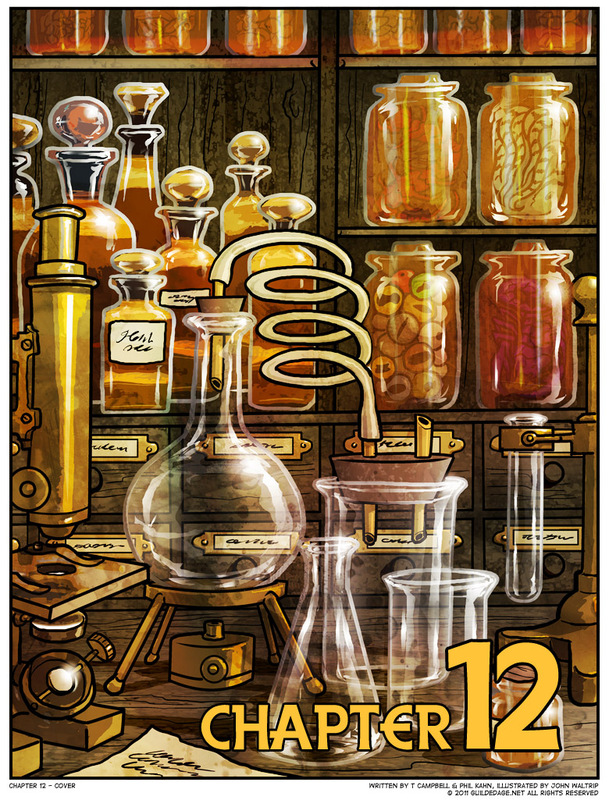 When an alchemist is mixing up elixers, it’s best to humor them.